When I include a segment in my Trawler Fest lectures about shorepower transformers I often ask attendees these three questions: “How many folks have a shorepower transformer?” “How many folks don’t know if they have a shorepower transformer?” “How many folks understand the function of a shorepower transformer?” The responses often make it clear to me that this is by far one of the least understood pieces of marine electrical equipment. Before delving into the details of how transformers work, it’s important to make the distinction between the two types that are available, polarization and isolation, and that distinction is purely a matter of how the transformer is wired. The hardware itself remains the same in either case. In a polarization transformer the green safety grounding wire that comes aboard the vessel from the dock, inside the shorepower cord, is connected to the vessel’s own green safety grounding, bonding and DC negative systems (i.e., shore and vessel grounds are common.) Hold that thought, it’s important. Polarization transformers ensure, as the name implies, that the polarity of the electricity that is provided to the boat is correct. Therefore, if the polarity of the wiring on the dock is somehow compromised, the neutral and hot wires are reversed (“neutral” and “hot” are, roughly speaking, the alternating current or AC equivalent of direct current, or DC, “ground” and “positive”) for instance, once passing through the transformer the fault is corrected. Isolation transformers work in precisely the same manner as polarizations transformers, they ensure proper polarity regardless of dock wiring, with one important distinction; the dockside green safety grounding wire is isolated from the vessel’s green safety grounding, bonding, or DC negative wiring. Why the separation and what’s the value and risk to such an arrangement? The isolation of the grounding systems achieves one additional goal for an isolation transformer—it reduces the possibility of “foreign” or other boat-induced stray current or galvanic corrosion. 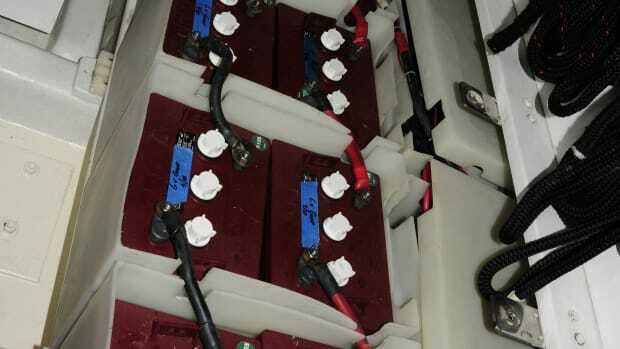 In order for other vessels to induce corrosion aboard your boat (including accelerating consumption of your zinc or aluminum anodes), the two vessels nearly always need to be connected, electrically. This connection phenomenon is common thanks to the ubiquity of shorepower cables, the green grounding wire inside that cable effectively connects your boat’s underwater metals to underwater metals of every other boat in the marina. Isolation transformers sever the ground connection between shore and boat, however, under any other circumstances such isolation would be extremely dangerous and a clear violation of ABYC guidelines. The green safety grounding wire that connects your boat to the dock and its power source is the only means of ensuring a safe path to ground for onboard AC electrical faults, and its reliability and integrity are critical. This connection enables a circuit breaker to trip when a fault occurs. Without it, the fault remains live and could potentially lead to electrocution or fire. When a transformer is installed, isolation or polarization, it behaves like a power source, like the utility company, like a generator or inverter, in that the neutral and green safety ground are connected or bonded at the transformer, making the shoreside ground unnecessary. The ground originates at the transformer rather than ashore. This is the only time your boat may be safely disconnected from the shoreside AC safety ground. To reiterate, for isolation transformers, there is no connection between the shoreside and boat’s safety ground. In the case of polarization transformers the ground between boat and shore is maintained. In the latter case, in order to afford the vessel some protection against corrosion that originates aboard other vessels, a galvanic isolator must be used in conjunction with the polarization transformer (for more on galvanic isolators see this Channels e-newsletter article: http://www.passagemaker.com/subscriptions/channels-e-newsletter/item/1485-galvanic-isolators-and-zinc-anode-selection. 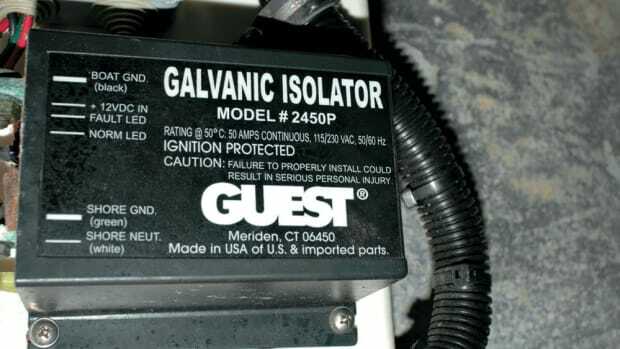 While galvanic isolators can be very effective at blocking corrosion, they are not foolproof; they are limited in their effectiveness. For absolute isolation and corrosion protection, a transformer would need to be wired in isolation mode, making a galvanic isolator unnecessary. Contrary to popular belief, electricity does not seek ground; instead it will attempt to return to its source. If the source is the utility company (or the transformer at the head of the dock), its power is referenced to earth, which means faults will return to earth in that case, or the water in which a vessel floats. If a fault develops aboard a vessel that is not equipped with a transformer, the current could leave the vessel via a bonded/grounded through-hull fitting, shaft, or rudder, and travel through the water on its way back to its source. If a person enters that return path, a swimmer, diver, or someone who falls overboard while dockside, they could be electrocuted—it happens every year. Last Independence Day, in three separate incidents, five people were electrocuted on lakes in the United States in this manner. Make no mistake about it, swimming around boats or docks equipped with shorepower is dangerous; it is prohibited in many marinas with good reason. My advice to readers is don’t do it. Because both isolation and polarization transformers behave very much like a source of power, fault current seeks a path back to them rather than to the shore. This means that onboard faults will not result in current flow through the water. Current will return to the transformer, ideally tripping a circuit breaker and rendering the fault inert in the process, making transformer-equipped vessels inherently safer. Why wire a transformer in polarization rather than isolation mode, if the former requires the use of a galvanic isolator, whose effectiveness is limited? Essentially, there is a measure of added risk—the level of which is debated by experts within the world of marine electrical systems, in wiring a transformer in the isolation mode, in that the metallic case of the transformer is not referenced to both shore and dockside ground. Therefore, if the hot, primary, or shoreside input cable of the transformer were too chafe against the case, because the case is connected to the boatside ground, it could become energized without tripping a circuit breaker. (Remember, it can’t be connected to both boat and shore ground without creating a path for corrosion current.) If a person were to then touch the transformer case and a through-hull or rudder stock for instance, they could complete the path, and be electrocuted in the process. While this is a real concern, if an isolation transformer is properly installed in accordance with the manufacturer’s and ABYC’s guidelines, it will remain safe. Currently, transformers may be wired as isolation or polarization, and remain fully compliant. Among the most common defects in transformer installations are those involving a failure to use manufacturer-specified strain relief connectors for cables entering the transformer’s case. Under no circumstances should a transformer be wired without the benefit of proprietary strain relief devices, which prevent chafe as well as isolating tension or strain from electrical connections within the transformer. Finally, shorepower transformers used in marine applications should carry a UL Marine approval decal (many transformers are UL approved, few carry a UL Marine approval) as well as complying with ABYC E-11.17, last revised in 2012. Many older transformers carry an ABYC E-8 approval, which is outdated. If you have a shorepower transformer, or are considering having one installed, or are purchasing a vessel that is so equipped, make certain it is installed in full compliance with current ABYC guidelines.